The passage of the CARD Act pretty much abandoned that measure of creditworthiness, and instead asked that credit card issuers use an applicant’s total annual income. This was all and good well for most applicants, seeing that they shouldn’t necessarily be able to add up the income of everyone in their house, especially if those individuals won’t actually ante up if the primary cardholder can’t pay. But the rule had the unintended consequence of shutting out non-working spouses from getting their hands on credit cards, even if their working partners were more than willing to foot the bill. For the record, census data indicates that 16 million married individuals do not work outside the home, which represents roughly one in three married couples. That’s a lot of potential credit card customers essentially shut out of the market. And so this week, the Consumer Financial Protection Bureau (CFPB) amended the ability-to-pay rule in the CARD Act that required credit card issuers to solely consider the individual card applicant’s independent income or assets. What this means is that card issuers will again be able to consider income for stay-at-home applicants that they share with their spouses, assuming they are 21 years of ago or older. This may include a joint account where the income is deposited each month or a situation where deposits are made into your account each month. This rule change applies to both new credit card accounts and those looking to increase existing credit card limits. In other words, these individuals won’t need to ask their spouse or partner to add them as an authorized user, or co-sign for a credit card. So that notorious income box on credit card applications should be altered in the near future to accommodate the new rule. Credit card issuers have six months to comply with the rule change, but will likely make the change sooner rather than later to get that untapped business. If you’re a non-working spouse looking for a credit card, it may be best to call the credit card issuer directly and explain the situation, assuming the online application hasn’t yet been updated. And if you apply and aren’t immediately approved, call the reconsideration line ASAP and explain that you have access to your spouse’s income. 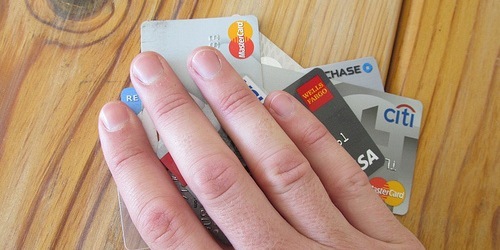 Read more: Do credit card companies verify income?